Friday, 22 July 2011, Day 241/365. The school holidays are finished now and I worked for most of them now that I have a job and might not have one in a couple of months. I did, however, have both the Fridays off and last Friday JJ and I went into the city to meet some people for a social media get-together. JJ lasted pretty well there for about an hour and then it was time to move on because he was getting bored. We walked to the museum and as it was NAIDOC week there was a heap of Aboriginal themed activities on. 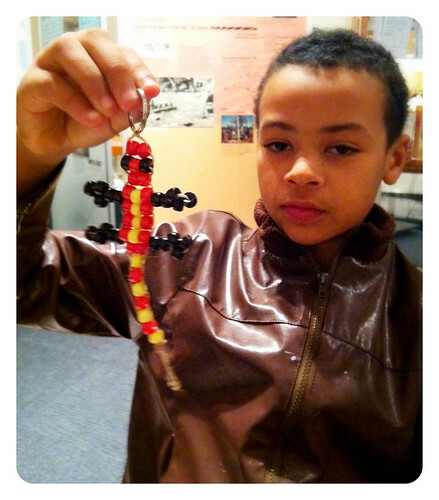 Most of them were a bit too young for JJ except for making this key ring. He did most of it with some help from one of the activity workers and a bit of help from me. After we’d finished we had a good look at all the minerals which JJ is right into. He wants to save up his money to buy a huge crystal and has bought a $40 amethyst already. I can’t imagine many other nine or ten year old boys spending their hard earned money on something like this. Overall it was a really good day and I’m pleased with how we’re going at the moment. We made a pact a couple of weeks ago for me not to yell at him and neither of us to swear. I’d not been modelling the best behaviour which I’m not proud of at all. I bought this book, ‘10 days to a less defiant child‘ and I’ve had a quick read of it and I’m sure I will revisit it. A lot of it makes sense and I could have been reading about my own child because so much of it described our exact situations. It talks about emotional intelligence which JJ lacks sometimes and I believe it makes him a bit silly which drives me crazy. I’d never thought of him in this aspect before and I know The Surfer doesn’t get it sometimes because his kids have more of this type of intelligence so usually act better in social situations. It has the ten steps mentioned in the title, one of which is no yelling. It’s so easy to get caught in the yelling trap when you’ve asked your child to do something three times and when they still haven’t done it you think the only way to get them to hear you is to yell. When you yell at your kid, especially your defiant kid, it just makes them more defiant. In the past this upping of defiance just made me yell louder which of course made it a lot worse. I’ve always envied those calm parents who don’t seem to rise to their kid’s defiance and stay calm. How do they do it I’ve always wondered. I know from bitter experience that yelling at him doesn’t work but it’s felt like the only avenue left open to me at times. Kate wrote a blog post ‘How to stop yelling at your kids or at least try to‘ and it has some great suggestions about the yelling thing. In the two weeks since I’ve been a recovering yeller I have noticed a difference. He’s been more considerate. He’s listened more. He’s been doing his allocated jobs in the morning and evening mostly without me asking and we’ve walked out the door for work and school calmly. He even offered to get me some water this morning when he saw that the glass near my bed was empty. He has been a bit silly but I’ve not fallen into the trap of yelling. If it really gets on my nerves I ask him to calm down because he’s acting a bit silly but mostly I try to ignore it. I haven’t been severely tested yet so that’s what I’m waiting for to see if I fall off the yelling wagon, or is it on? If you’ve ever done a behavioural change programme before you will know that you ARE going to fall off/out of the programme at some point. The art of continuing is to not beat yourself up about it and get back on track ASAP. Been there, done that one – and with my youngest resorted to smacking as the only way to get through to her! I never had to with the other three but she knew just which buttons to press – and delighted in doing it.